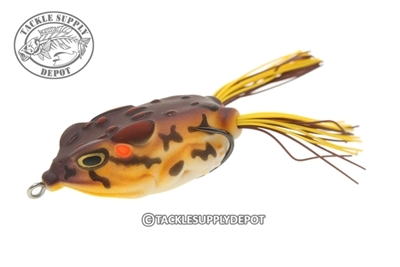 Pro and avid anglers have been modifying their skirted frogs for years. The goal being to create a smaller target for bass to hone in on. Modifications create a frog that bass can eat in a single strike. The Lunkerhunt Compact Frog has been designed for maximum efficiency and high percentage hook sets. It features short skirts, a compact body design, short wide gap hooks, and delivers high buoyancy right out of the pack. The Lunkerhunt Compact Frog has a smooth, consistent walk that pushes water and simply catches fish.